A natural oasis away from the city. This gorgeous lakeside chalet sleeps 14 people comfortably with 4 bedrooms, 3 bathrooms, living room, dining room, and kitchen. 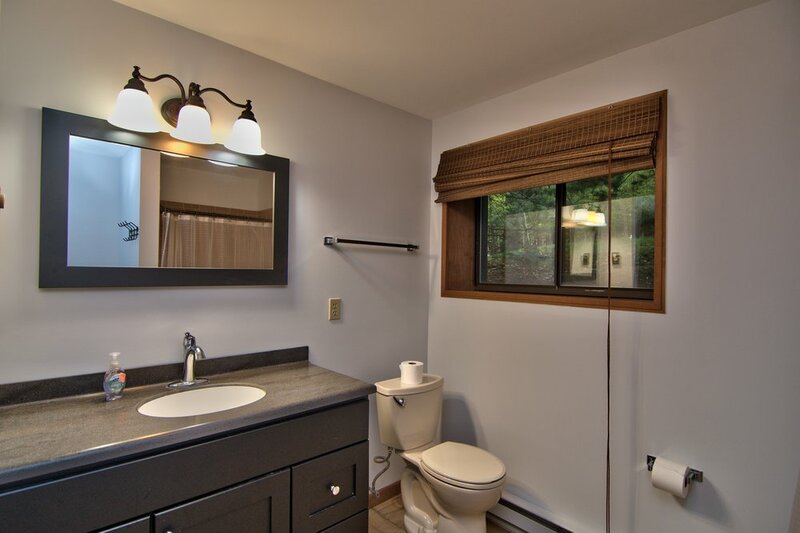 Experience the beauty and serenity of Lake Wallenpaupack from the comforts of this home or spend the days away swimming, jet skiing, or lounging on the lake. Our family has enjoyed the beauty and serenity of Lake Wallenpaupack for generations. Our Mountain Chalet is the perfect place for you to relax with your family and enjoy making memories at the lake just like we did. Fill your days with fun-in-the-sun activities like fishing, tubing, swimming, boating, jet skiing and just plain relaxing! Spend the day on the lake then come home to BBQ on the large lake view deck. Or just keep swimming and drop anchor at one of the many lakeside restaurants. There's always room to park at their docks! The upper level has a large bedroom with two queen beds and bathroom with shower. The middle floor has two bedrooms, one with a queen and one with two bunk bed sets where 4 can sleep and a full bathroom with tub/shower combo. 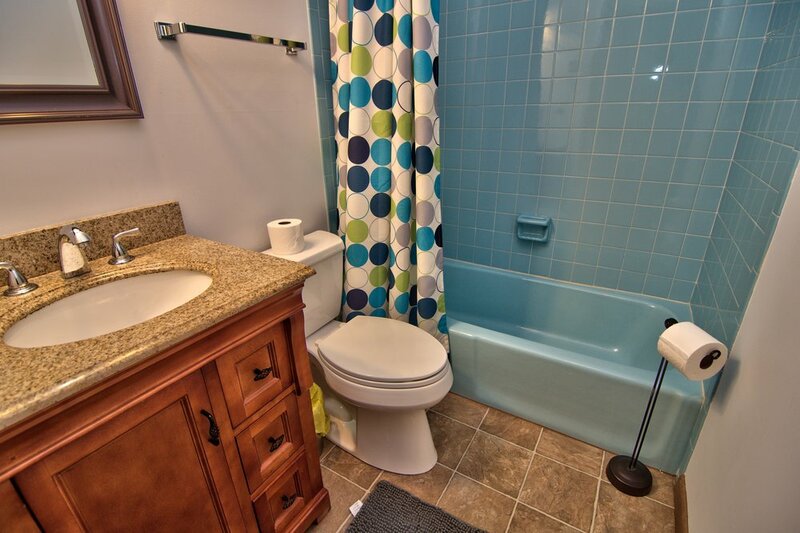 On the lower level there is a large bedroom with a queen and two twins and full bathroom with shower. The main living area has section sofa, TV and wood burning fireplace and the open floor plan allows all to gather and enjoy each other's company either around the large dining room table or outside on the deck with table, BBQ grill and lounge chairs. Lower level family room has large sectional sofa, TV, Ping Pong table and access to patio overlooking the lake. You'll find it all here waiting for you in this rustic chalet! Through the lower level's outdoor access, you'll find a comfy hammock for ultimate relaxation and outdoor firepit. Trekking to the lake is an easy few steps down our stone walkway leading straight to the edge of Wallenpaupack's lapping shoreline. 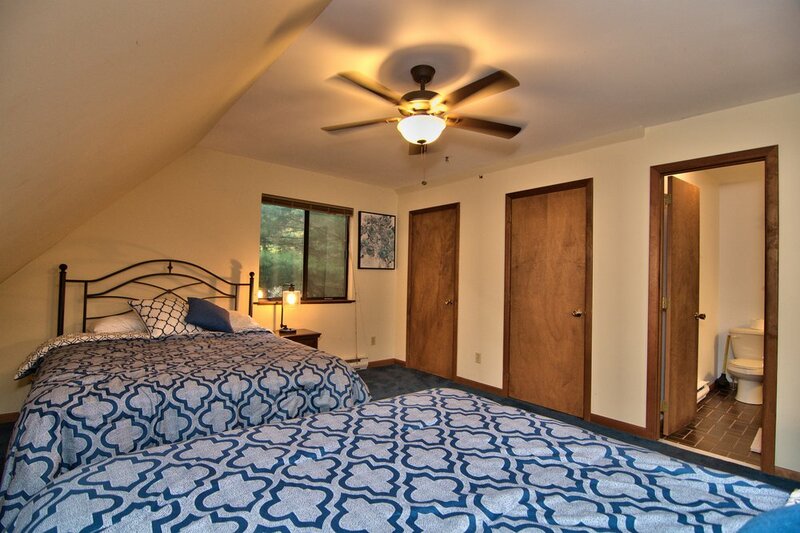 We hope you enjoy your stay and make wonderful memories in our Lake Wallenpaupack Chalet. "My family and I booked this house for a labor day weekend getaway. Cindy (property manager) was very responsive in the booking process/arrival process. We arrived to the house and found it to be surprisingly big (meant for large families/parties). It had many beds, two living rooms with big couches, dining table, 2 outside decks overlooking the lake. The house and its furnishings are far from new, so don't go there expecting a 5 star modern home, but for a lake getaway with a big group its perfect. Cindy was great in accomodating our needs, we rented a boat and needed the dock farther out then it was and her and her husband came right over and helped us push it out. Would stay here again, in the future!" My brothers, our friends, and I visited this house for a birthday weekend and it was even better than my expectations. The house and property is beautiful, well maintained, and more than comfortably fit the nine of us. The property manager promptly resolved any questions I had before, during, and after the weekend. 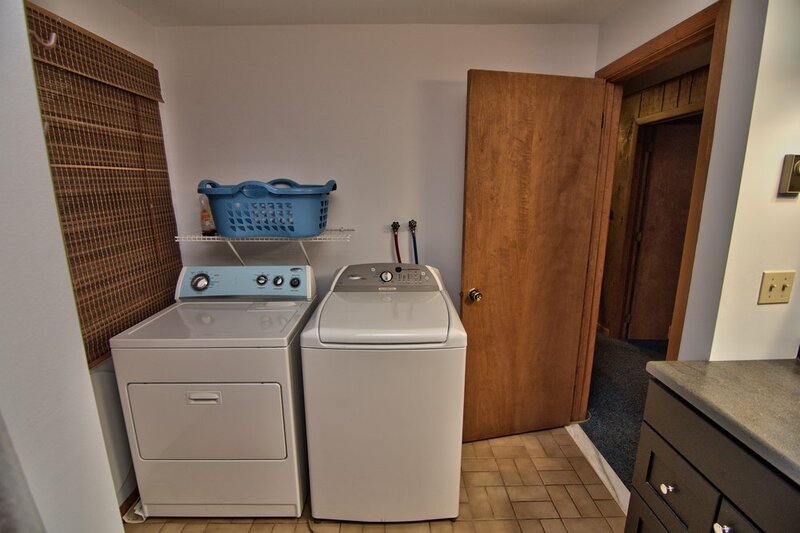 The location is great: secluded, but close enough to town so that you can quickly stop by the grocery store, visit a restaurant, play golf, etc. This is a great house on the lake. 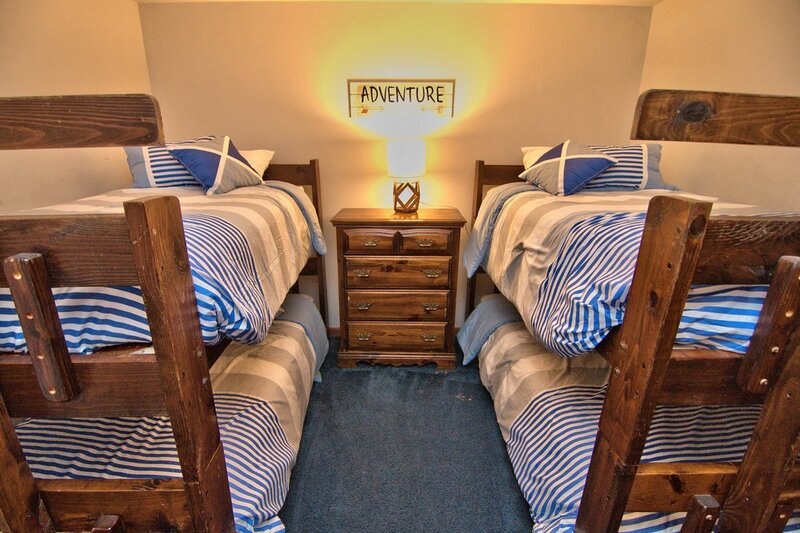 It has a excellent mix of rooms and beds that made sleeping arrangements easy for our family and friends of varied ages. The lower level with the extra fridge, ping pong table, tv, large sofa, and video games worked out nicely for our teen guests. We brought our boat and launched it at Caffrey's Recreation Area which is 5 minutes away by boat and 10 minutes by car. We had a blast boating, fishing and tubing. The house was clean , decently equipped and well maintained. Cindy the real estate manager was excellent with communication and attentiveness. She called to check in on us to see if we needed any propane and arranged a prompt pickup of trash when the cans got full. Little things like this make the difference. Thanks Cindy!